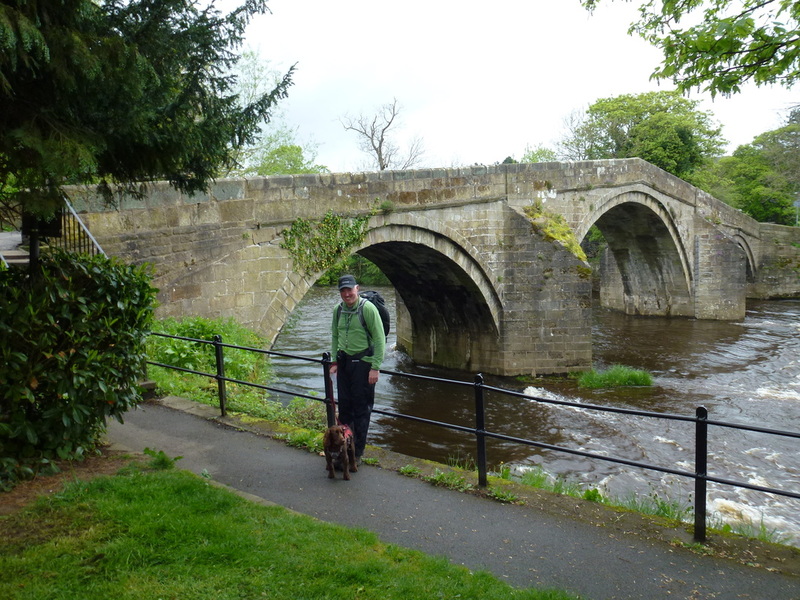 After a good nights sleep we breakfasted at The Riverside, sorted our gear out and made our way the short distance to the 17th Century bridge over the Wharfe which is right by the official start of The Dales Way. The weather was not looking too bad although it was forecasted to rain for some part of the day - hopefully we would escape a torrential downpour and arrive in Linton dry - ever the optimists!! 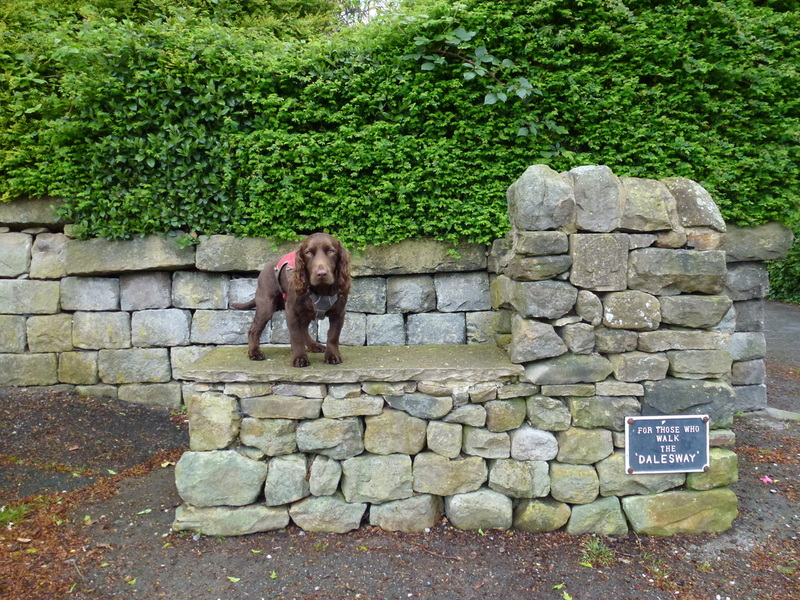 There is a lovely stone bench seat at both the start and finish of the Way and therefore Fudge took it upon himself to pose for a photograph before we started the 80 odd miles over to Bowness. 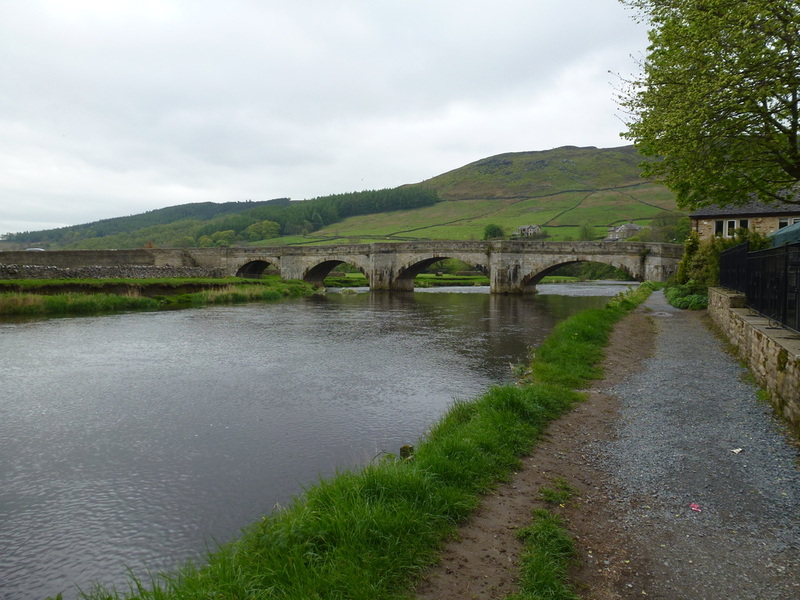 Today's leg was a fairly flat one taking in Bolton Abbey, Barden Bridge, Burnsall and finally Linton therefore we intended to take our time and enjoy it. The start of the route is semi urban and after passing Ilkley Tennis Club joins a field path where we were passed by a group of gentlemen who were also starting The Dales Way today - there were about 8 of them therefore we christened them "The Gang o' Lads" - our paths were to cross several times over the first couple of days before our itineraries split at the end of the second day. 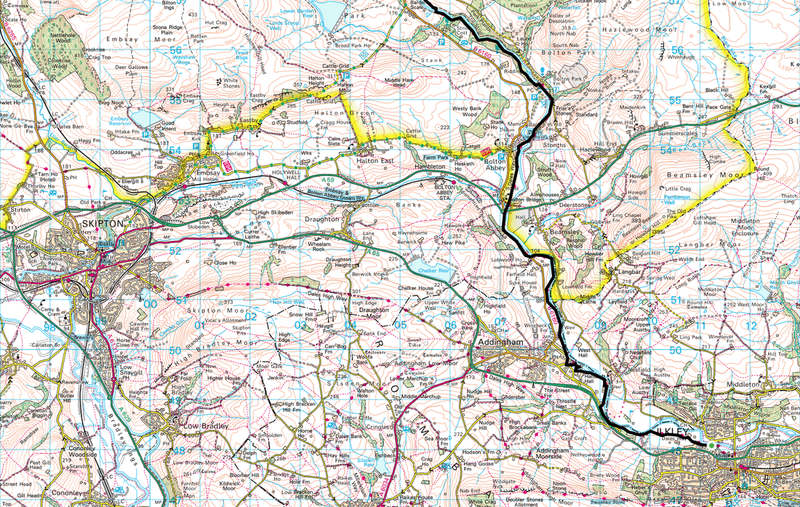 The path today followed the River Wharfe all the way to Linton therefore route finding was a doddle and we hardly looked at the GPS or map. 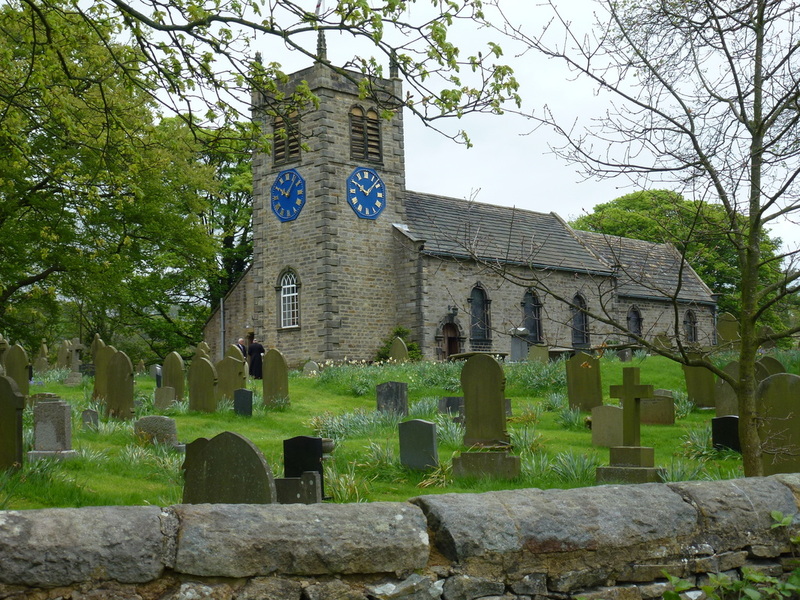 Reaching Addingham, we passed by the 15th Century village church of St Peter's which has a rather unusual blue clock face which seems out of keeping with the rest of the building but is quite eye-catching all the same. It was clear to see that a lot of work had gone into the footpaths as the signage throughout the walk was excellent - even though we had all the relevant maps and a GPS we would have found it particularly difficult to go astray on this walk. 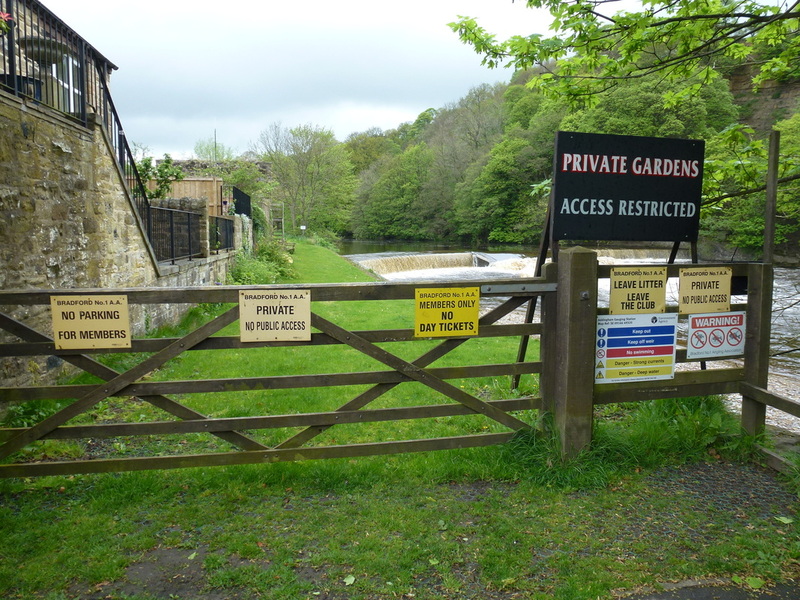 The Wharfe was an excellent handrail today - plus Fudge had plenty of opportunity to go swimming. 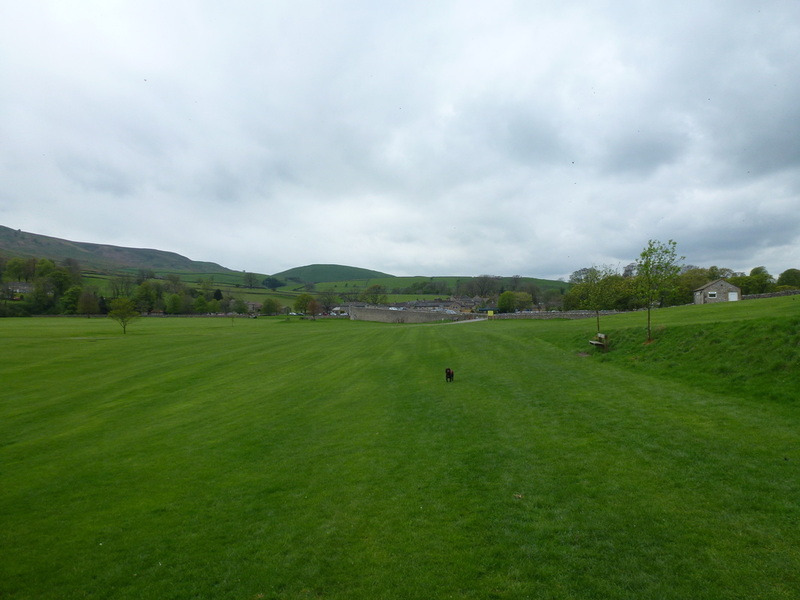 The next milestone was the beautiful Bolton Abbey. We had been here before but were not seeing it on a good day today. It started to rain and the light was poor therefore the camera only came out sporadically. The Wharfe was quite high as the famous stepping stones of Friars Steps can only just be seen in the photo above. Undeterred, we passed the Gang o' Lads just before Cavendish Pavilion where we stopped for a drink and a quick snack. 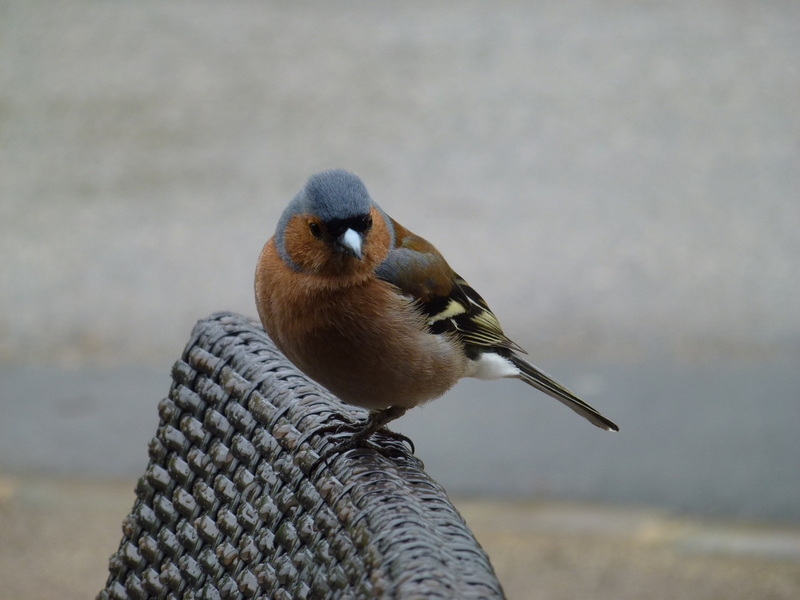 How cool is this Chaffinch!! 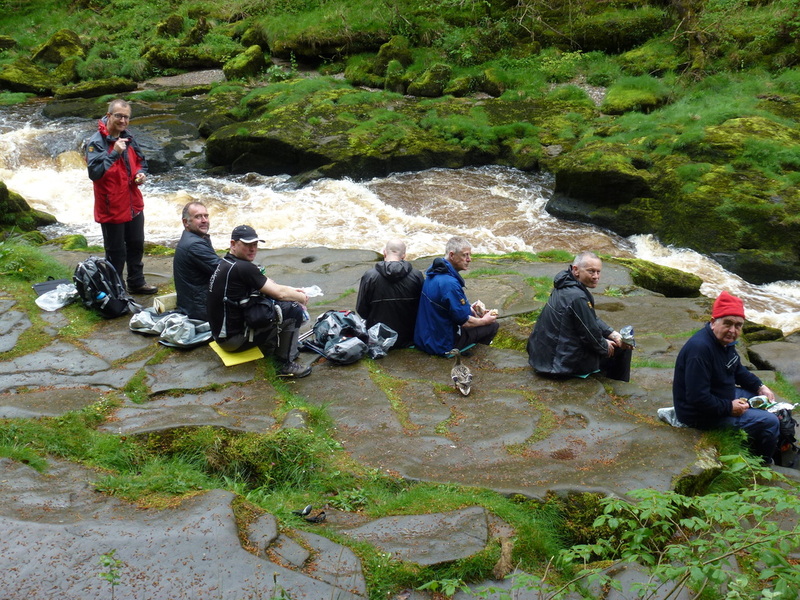 After a 20 minute breather we made our way into Strid Wood. This is a delightful stretch of pathway leading to The Strid - a narrow gritstone gorge about 2 metres wide. Here the river has gouged out deep underwater canyons and there have been many casualties and fatalities here in recent times as people have attempted to leap across the gap. 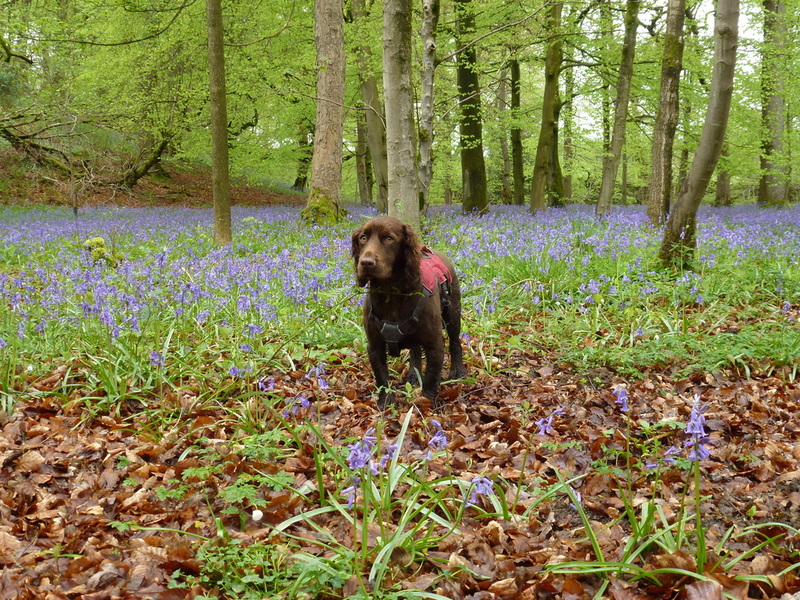 Strid Wood is idyllic and the bluebells were out in force. 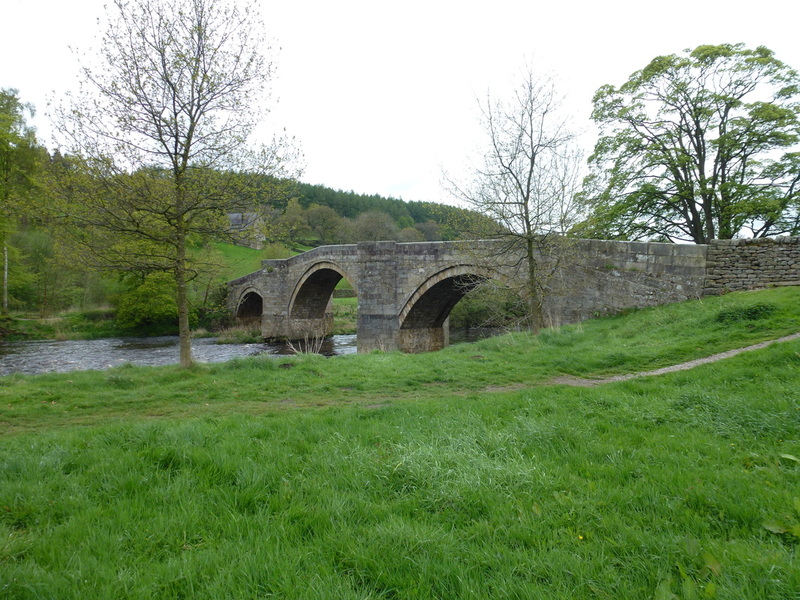 Once The Strid is passed the route meanders up past an aqueduct and on to the pretty 17th century stone arched Barden Bridge. It was here that we were attacked on and off for a couple of miles by black fly beasties who would not bugger off. 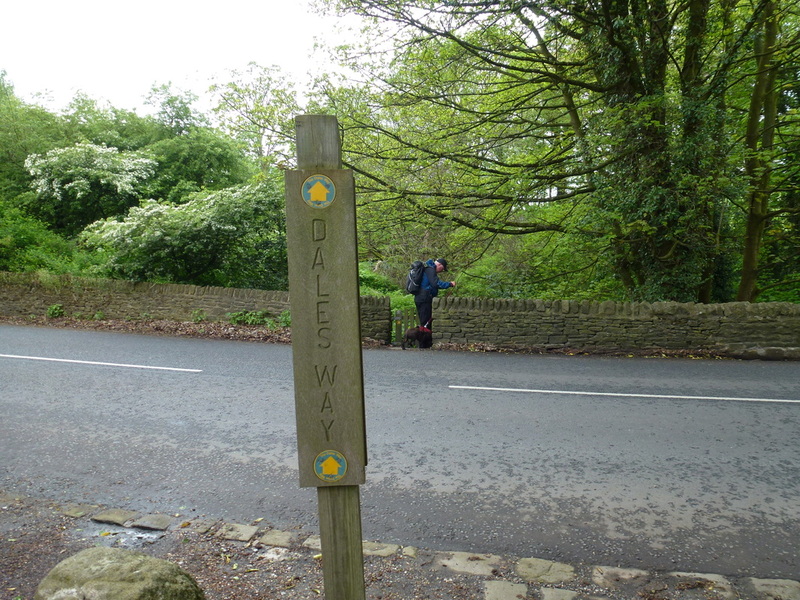 We were now on familiar territory having walked this stretch of The Dales Way a couple of years ago whilst staying in Hebden. 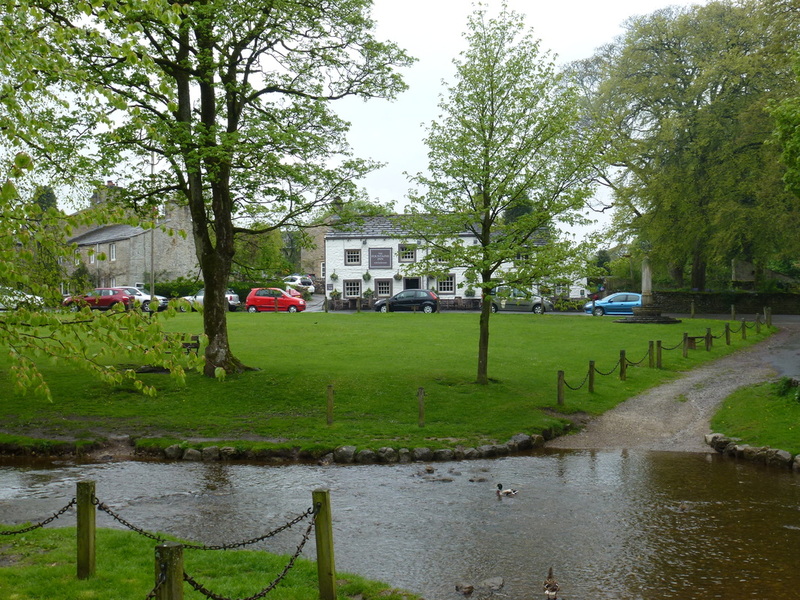 We skirted the village of Appletreewick and made the very pleasant approach to Burnsall. The village is very pretty and its riverside location is popular in the summer however all was quiet today. Crossing the large village green, we stopped at The Red Lion for a refreshing drink and were soon joined by the Gang o' Lads who had caught us up. Suitably refreshed we headed along the Wharfe to the suspension bridge at Hebden. It was here that it really started to hammer it down and it remained that way for the remainder of the walk. 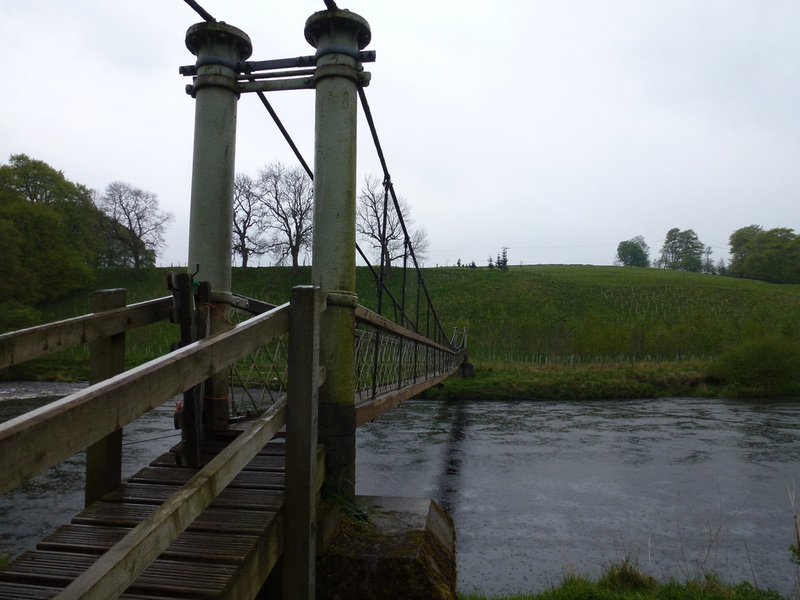 The suspension bridge at Hebden - we had approached the bridge from Burnsall on the other side and from the left. Crossing the bridge, we passed a rather dishevelled gang of DofE youngsters who were sorting themselves out and and turned left to head the final three or so miles to Linton. Ordinarily this is a lovely stretch of the walk but today was spoilt by the weather. 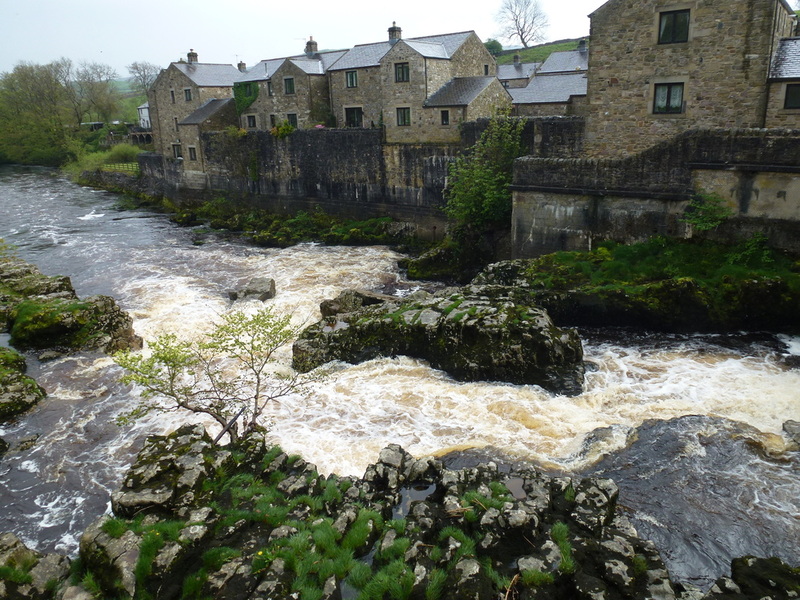 No matter, we soon reached Linton Falls, which were in full spate and headed up the road to the village. Linton is a beautiful village and our bed for the night was on the edge of this quiet spot. Tempted as we were to visit The Fountaine Inn, we made our way up to Linton Laithe where we were met by the owner Sean who had recently taken over the business with his partner Mike. Suitably showered and changed, we made our way the short distance to the pub for dinner and a refreshing couple of pints of Black Sheep. Despite the weather, this was a lovely days walking through some beautiful countryside. 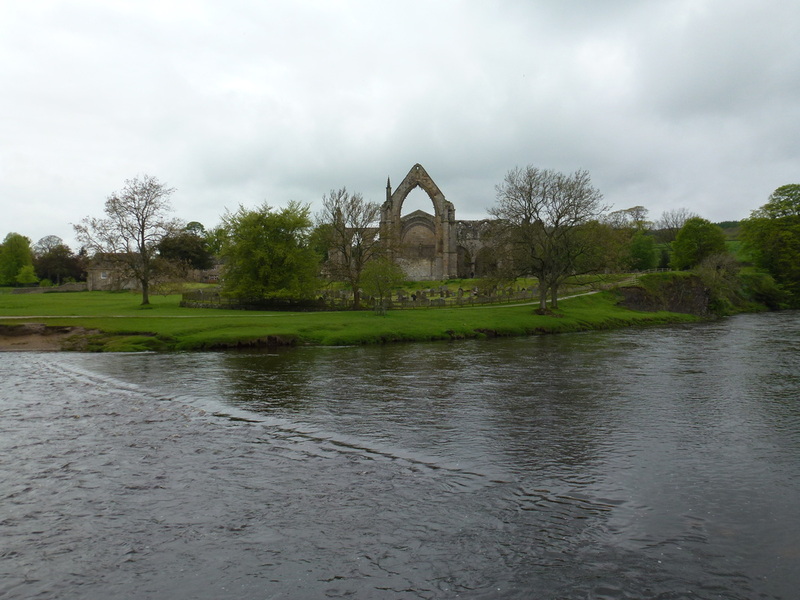 Bolton Abbey is always lovely as is the walk from The Strid right through to Linton. 17 miles is a fair old hike but the going was good and more importantly flat and the miles just whizzed by. We are looking forward to the walk over to Cray tomorrow. 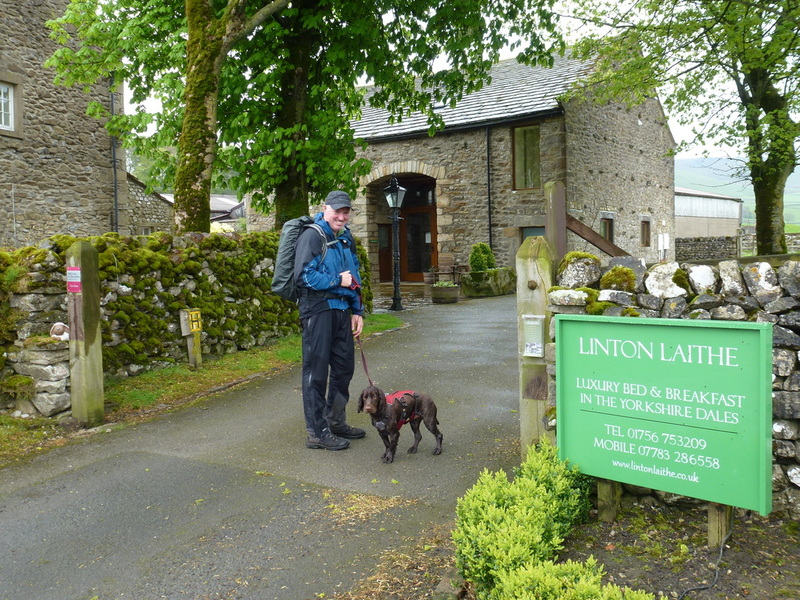 About half a mile off the route but an excellent dog friendly B&B in such a beautiful Dales village. Mike & Sean could not do enough for us and this was easily the best B&B of the entire walk. The village also has a superb pub, The Fountaine Inn which is dog friendly.